In the Fall of 2016, Yale First Nation signed on with modular builder, Britco, to start a housing revolution. For the past few years, Yale has been struggling to solve its housing crisis. They have a need, they have funding, but the solutions that existed did not necessary bring true affordability to the Nation’s 160 band members – specifically those that live on reserve. Yale First Nation’s existing housing was becoming uninhabitable, with basic structural issues plaguing many members’ homes. Housing that had barely met building codes when it was built 22 years prior was now structurally unsound. Their homes were literally falling apart. And substandard housing wasn’t the only issue for the Yale First Nation. In winter months, the majority of their community members would have difficulty paying their Hydro bill – which isn’t surprising considering the average Hydro bill last winter came in at $350. This left the Nation helping its members pay those bills and, at times, footing the bill for food and other necessities as well. The housing revolution begins with two townhouse complexes for ten Yale First Nation families built to Passive House standards. Passive House standards are currently the highest standards of energy efficiency in a building available in the world today, making Yale First Nation the most energy efficient First Nation in Canada per capita once the townhouses are complete. This extreme energy efficiency will reduce energy costs by 80% and the members living in the townhouses will see and feel the difference in quality and comfort immediately. When pairing Passive House standards with controlled off-site modular construction techniques, the quality of the building itself is drastically increased because Britco is able to oversee every step of the construction process to ensure quality and attention to detail. This style of building also helps sound-proof the units and doesn’t expose materials to inclement weather during the build. Through their work together, the Yale First Nation and Britco are striving to make quality sustainable housing with lower operating costs more accessible to Indigenous communities. In some cases, remote communities are relying on extremely costly diesel generators to heat their housing – which takes a financial toll on the Nations, as well as an environmental one. In addition to reducing energy costs, Yale First Nation’s new Passive House townhouses will emit 80% less greenhouse gas emissions than traditional housing – which aligns well with their beliefs in sustainability and stewardship. 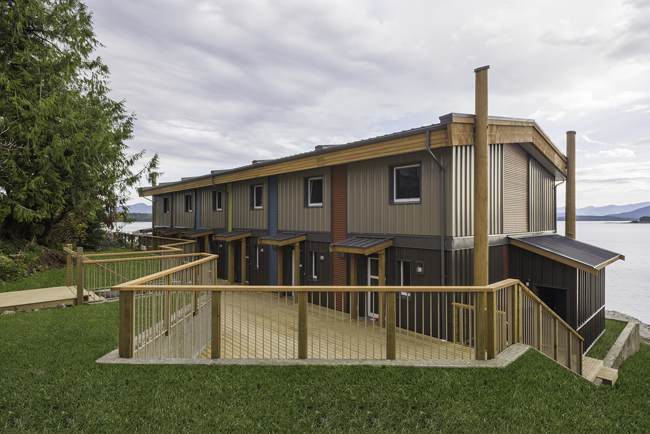 Although building to Passive House techniques is new to Canada’s First Nations communities, Britco’s first Passive House project was completed in 2015 for Vancouver Coastal Health Authority in Bella Bella, British Columbia. With the support of Yale First Nation, Britco is establishing new benchmarks with this project that will be viewed as an achievement never before seen in a First Nation community. Both Yale First Nation and Britco share a vision of long term sustainability, environmental responsibility, energy efficiency and economic vitality in an on-reserve housing initiative that will undoubtedly serve as a model for Indigenous communities across the province and nationwide. As one of the most sustainable and eco-friendly residences in an Indigenous community in North America, the Yale First Nation Passive House will provide the Nation the opportunity to share their stories, successes and mentor and guide other communities through the process. Yale First Nation is an independent First Nation located in Yale, British Columbia, with approximately 160 band members living on and off reserve. The Nation has 13 Staff members and a full-time, 3-person Council who, collectively, are responsible for Community Health, Band Support, Housing, Finance, Social Development, Economic Development, Education, Fisheries, Maintenance and Natural Resources. Britco is one of the largest commercial modular construction companies in North America, providing innovative solutions to temporary and permanent residential and commercial modular buildings. Britco offers leading design-build capabilities as well as turnkey construction management services with a focus on permanent modular construction, workforce accommodations and temporary construction site offices.